Harriet Tubman Wins Unofficial Contest To Be On $20 Bill : The Two-Way The Women on 20s campaign is petitioning President Obama to put the face of Harriet Tubman, the escaped slave who led others to freedom, on the $20 bill. She edged Eleanor Roosevelt in a close vote. With 118,328 votes, Harriet Tubman edged Eleanor Roosevelt in a campaign to put a female face on the $20 bill. 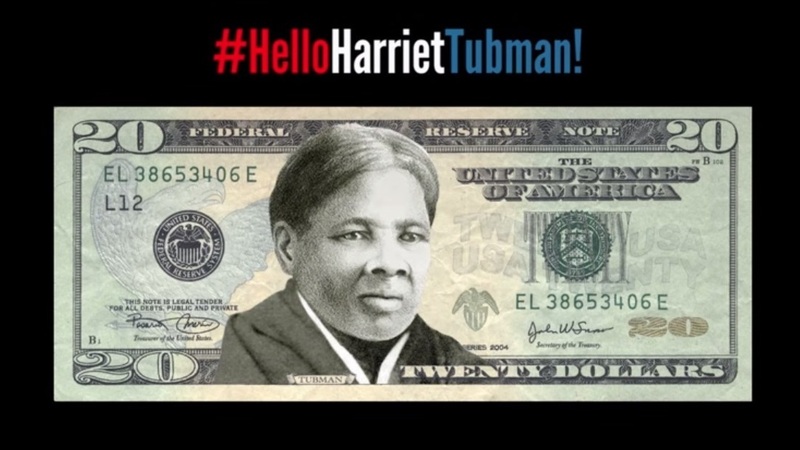 The Women on 20s campaign, which seeks to put a female face on the $20 bill, has announced a winner: Harriet Tubman, the escaped slave whose ingenuity and courage led other captives to freedom. Tubman narrowly edged Eleanor Roosevelt, finishing with 118,328 votes to Roosevelt's 111,227, according to Women on 20s. More than 600,000 votes were cast over 10 weeks, including more than 350,000 in the final round that began on April 5. Early on, Roosevelt had led Tubman by nearly 15,000 votes, but the final round brought a reversal. We'll note that Tubman's appearance on the $20 bill would have a special historical resonance: That's the same amount she eventually received from the U.S. government as her monthly pension for her service as a nurse, scout, cook and spy during the Civil War, as well as for her status as the widow of a veteran. A petition has now been sent to President Obama asking him "to order the Secretary of the Treasury to change the current portrait portrayed on our American $20 bank note to reflect the remarkable accomplishments of an exemplary American woman who has helped shape our Nation's great history." In the Women on 20s vote, Rosa Parks came in third, with 64,173 votes, and Wilma Mankiller, the first woman to become the Cherokee Nation's chief, was fourth, with 58,703. Others on the ballot included Susan B. Anthony, Sojourner Truth, Clara Barton and Elizabeth Cady Stanton. While the images of George Washington, Andrew Jackson and other historical figures on U.S. currency are bound by tradition, they appear at the discretion of the secretary of the Treasury Department. The department's own records "do not reveal the reason that portraits of these particular statesmen were chosen in preference to those of other persons of equal importance and prominence," according to one of its official websites. The Treasury adds, "By law, only the portrait of a deceased individual may appear on U.S. currency and securities." "President Obama already has publicly expressed an interest in featuring more women on our money. With at least 100,000 votes, we can get the President's ear. That's how many names it takes to petition the White House for executive action. We went way beyond that with well over a half a million votes backed by names and email addresses." The group says that because Tubman, Roosevelt and Parks all attracted more than 100,000 votes at different stages of the voting, they all qualify for their own petitions. Tubman's victory comes two years after the centennial of her death in 1913. At the time, NPR's Michel Martin spoke to the Smithsonian National Museum of African-American History and Culture's chief curator, Jacqueline Serwer, about Tubman's varied life and legacy. "Well, she was very smart and had a wonderful memory and knew these byways and these secret routes like the back of her hand and so, when she rounded up a group of people whom she was going to lead to freedom, she knew exactly where to go, where to hide, when to wait, how to escape the slave hunters who were looking for her and looking for the folks that she was bringing to freedom. And she was just very clever. She was also very disciplined, so people, you know, who were tired or who wanted to do something different — she was very strong and could be very harsh at the same time that she was a very kind woman." Serwer also noted the famous threat Tubman made to any fugitive who might lose their nerve on the path to freedom. "She would kill them. She couldn't risk all the others for the sake of — you know, of somebody who was going to fall by the wayside." Tubman isn't known to have ever carried out that threat, Serwer said.